Cross joins across user defined hierarchies aren’t supported .? It’s not appropriate to post as this a blog but it might help to most of us in field of BI having similar kind of confusion /issue. I have some confusion on crossjoin function within MDx. Cannot we Cross joins across user defined hierarchies ,or they aren’t supported .? Coz I really need to implement as above MDx within my real Cube. I try to implement by making as another Hierarchy Member but it doesn’t gives the value result as what we want/need. Though while looking on Adventure Works Cube ,it has attribute as Country, State-Province, and others along with the User define Hierarchy as Customer Geography with in a Customer Dim. But similarly, while we try to crossjoin with in the attribute members of user define Hierarchy from Customer Geography it gives error. Does this mean we cannot crossjoin across user defined hierarchies? It is just an example ,I simply need like this within from same user defined Hierarchy. By defining as user define calculated member of different attribute/dimension I am able to obtain the output as below but the values doesn’t valid or match. Backup all SSAS databases automatically and schedually. With the course of time, you might need to backup all the SSAS databases within a server instance automatically and schedule to backup these database monthly wise or according to your specific time set. May be there are a lot of alternative methods to perform this task and many solution’s. But I have researched a lot regarding to backup all the SSAS databases within a particular server instance. In my last blog post I have shared “How to schedule and dynamically backup all the SQL databases within a server instance”. Here ,I am going to show how to obtain all the cube databases backup automatically along with schedule time set. These are the following steps you should have to follow. 1. Adding a linked server in SSMS. –Setup security as per your environment requirements. 2. 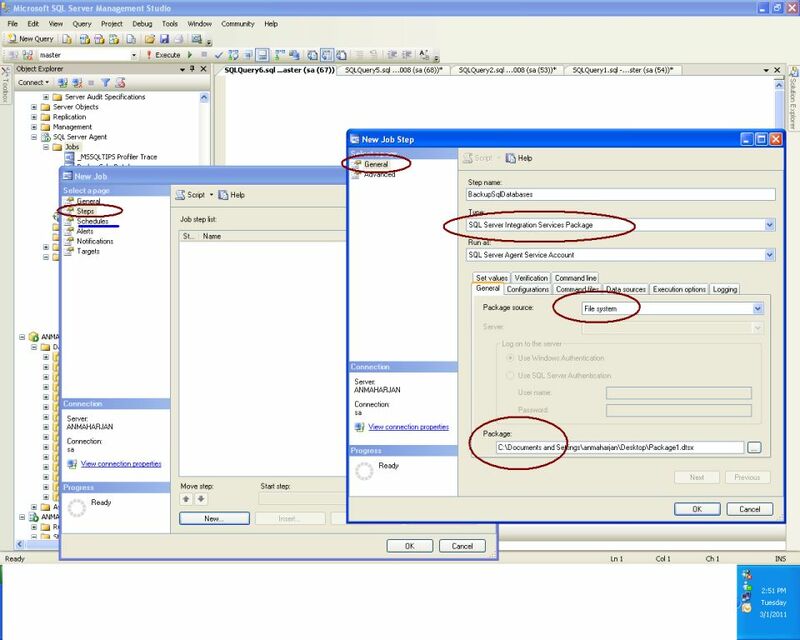 Make a SSIS package. 2.1. Create the table in SSMS of the output of all the catalog name within a server given by frying the query into the DMV in SSAS from SSMS. You can use the following script in order to find all the current catalogs name within a server. 2.2. Read the total no of database backup to be made by reading the max count of catalog name from the table just we created above. 2.3. Read the backup XMLA within a variable into SSIS from a particular location.i.e backup XMLA that generated manually and we can also generate it by using a some C# or vb.net code embedded within SSIS. 2.4. Now, within a for loop, set the max loop to the variable as @Max_No_Backup i.e max no of backup to be made. 2.5. Here read the catalog name of database with in a server one by one by using a table that we created before from CubeBackupInfo. 2.6 Modify the XMLA script using ‘Script Task’ within where I have used C# code in order to modify the XMLA and generate the modified XMLA for each catalog name one by one. 2.7. Backup all the cube database with in a server into a default location of SSAS backup. -also catalog name can overwrite it if it exist already. 3.Make a SQL Server Job agent. 4.Make schedule to backup all the catalogs/ database within a particular server. i.e. monthly or weekly according to your specific time set. Hope this will help for someone , also I am thinking to post another blog about ‘Dynamic partition within a cube’ using a similar approach where I have researched a lot in this topic too. How to schedule and automate backups of all SQL Server databases in SQL Server. With the course of time, you might need to backup all the databases within a server instance automatically and schedule to backup these database monthly wise or according to your specific time set. Also, what I want to say is that ,I cannot stop myself to write this another blog of mine. This may be simply for one but for someone it will be helpful for those who don’t know how to do it. But I have researched a lot regarding to backup all the SQL database as well the SSAS catalogs database backup with in a particular server instance. Here ,I am going to show how to obtain the SQL database backup automatically along with schedule time set. Then we can set the Backup Type as full or other type after that you can select the databases to backup as show in figure2 below where we can set required databases to backup. 5.Backup location directory currently I set to default location. You can figure out by looking the figure3 below. or simply go to SSMS and start Sql Server Agent and right click and create new job where you have to setup some properties as shown in figure4. Hope you get some ideas to obtain the schedule Sql databases backup automatically ,also I am thinking to post into my another blog for “ Automate and schedule all SSAS catalogs database backup with in a server instance by using Job Agent” or similar approach which have taken most of my research time and I am happy to obtain the result successfully. Lastly,this may be simple but I think it may work out for someone .